I had my eyes closed and depressingly groaned, “what should I do a Dee strip about?” Cedra replied, “a mockingbird.” And sometimes it is just that easy. 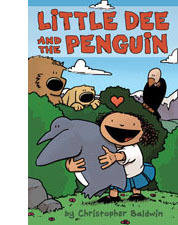 “Little Dee and the Penguin” is available for ORDER on most online retailers including Amazon: Little Dee and the Penguin in both soft and hard-cover! Or request it in your local bookstore! Seed planting, or bird buffet? You decide. I do not think medical staff are gods. I think they do their best with the information they have. So i try not to get frustrated when the first diagnoses is not quite correct. I sometimes feel like I need a glucose oral drip, wheel it around with me all day. Beeps and blips in a hospital CAN be quite annoying, until they are so ever-present you stop notching them. And to say I wasn’t influenced in this strip by Monty Python’s “machine that goes ping” would be blatantly untrue. 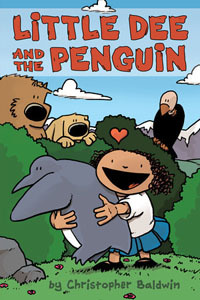 The blurring of lines of the Little Dee world, when a pet could have a pet, and when dumpster donuts are the best.